Bicycle tours, bicing city bikes, 200km of special bicycles lanes and more. Barcelona is embracing the culture of bicycles and has become one of the most bike friendly cities in Spain and Europe. Barcelona has many bicycle lanes and you are welcome to cycle through Barcelona's sqaures and parks. More than one hundred thousands trips by bike are made every day in Barcelona. Bicycles are also popular with tourists and a bike tour of Barcelona is a fun, relaxing and healthy way to see some of the sights of Barcelona. Tourists can also rent bicyles and explore the city on their own. Here are some useful links to help you find Barcelona bicycle tours, bike rentals and city bicycle resources both for visitors and residents of Barcelona. The Mediterranean climate in Barcelona is perfect for bicycles and there is no downside to supporting bicycle transport. Cycling is green, clean, healthy, cheap, quiet and fun. Which is why the city of Barcelona is supporting bike transport with many new initatives ranging from the Bicing city bikes scheme for residents to the many kilometers of new bike lanes and new features like special bicycle traffic lights. Bicycle shops, bike taxis and bike tours are also flourishing in Barcelona with more and more visitors choosing this as an active way to see the city. It's a fun and practical way to see the city and it helps keep the calories from tapas and cervezas under control. Remember to wear a helmet if possible and to follow the Barcelona bicycle traffic regulations which you can find in English here. Tickets Barcelona Bike Tour. 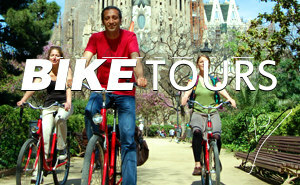 Three-hour guided Barcelona bike tour which includes guide, helmets and child seats. Morning or afternoon departures. See Barcelona in a fun and healthy way and discover the city's main landmarks with an local guide who will take you through Barcelona old city from Plaça Sant Jaume, through Plaça del Rei and Plaça Sant Felip Neri, past the cathedral and through Plaça Reial as far as the Columbus Monument and the old harbour, Port Vell. You'll also visit the Barceloneta beach, the Olympic Marina and the Sagrada Família, where you'll be able to take a breather and look at this wonderful Gaudí building, and then make your way to Passeig de Gràcia and admire the spectacular Casa Batlló and La Pedrera.